services where ridership isn’t the goal, and explained that every transit system has “Coverage” services, designed to achieve a perception of equity and/or to meet the severe needs of small numbers of people. Coverage services generally cover low-density areas where ridership will always be relatively low. Could the empty-running coverage-oriented buses be replaced with some sort of dial-a-ride system running full? Yes, where you have a low-density and therefore low-ridership market, you can often replace empty fixed route buses with Dial-a-Ride systems. Dial-a-Ride in this context means a form of demand-responsive service, usually run with small buses or vans, where the route followed through its territory is different on each trip based on who calls and asks for the service. Dial-a-Rides can be ordered by phone or website, just like taxis but with less flexibility. Pickup times may not be ideal, and unlike a taxi your Dial-a-Ride van will make other stops to carry other passengers along the way. But Dial-a-Ride systems rarely have many more riders than the fixed routes they replaced. More commonly, these transitions increase productivity (riders/unit of service cost) by acting mainly on the bottom of that ratio, i.e. they serve the same small numbers of people with service that’s less expensive to operate. In a typical big urban region, the highest-performing all-day routes — the ones that run high frequency through dense parts of the city — usually score over 30 boardings per revenue hour and often closer to 50. (A revenue hour is one transit vehicle operating for one hour.) Physically, it’s almost impossible for a Dial-a-Ride style of operation to serve more than 10 boardings per revenue hour. Now if you have a low-density area where empty fixed bus routes are running around scoring 5 boardings per revenue hour, I may be able to replace those buses by half as many Dial-a-Ride vans serving basically the same people, and thus scoring 10 boardings per revenue hour. That’s an improvement, but it doesn’t begin to bring these low-density places into the performance league of high-density ones, where 20 boardings per revenue hour is considered disappointing. I should clarify, too, that when I say Dial-a-Rides usually don’t attract a lot of new riders, I’m talking narrowly about a case where a bunch of empty-bus fixed routes are replaced by Dial-a-Ride vans. I’m also talking about Dial-a-Ride in the transit context, where multiple passengers are consolidated into one vehicle by making multiple stops, and thus often following a circuitous path. There are higher-end forms of Dial-a-Ride, such as door-to-door airport shuttles, but these are another matter. It seems like dial-a-ride systems could benefit massively from the improved dispatching that computers make possible, and things like smartphones could greatly improve the user interface as well. You could have an app that lets you order a ride from “here” (determined by GPS) to a point that you pick on a map, letting you know how long it will be until you are picked up and how long the trip will likely take, and how much it will cost. Very different, and likely to be much more popular, than the earlier model of “schedule your ride at least 24 hours in advance”. Dial-a-Ride is an area of great technological ferment. There are lots of opportunities to improve the ways that Dial-a-Ride can be dispatched, making more spontaneous use possible. These improvements could vastly expand the demand for Dial-a-Ride, but they don’t change the physical limits of supply. Look at it from the perspective of the driver, who sees the calls pop up on the screen. Regardless of the dispatch method, Dial-a-Ride means each passenger requires her own bit of routing and a separate stop. In this style of operation, will you really be able to pick up a passenger every three minutes, on average, all day? That’s what it means to achieve 20 boardings per revenue hour, an astronomical performance for a Dial-a-Ride but still very low for an urban fixed route. The only way to get higher performance is if you get lots of people traveling as groups, i.e. not requiring the individual responsiveness that is the whole point of Dial-a-Ride. This whole issue is important because it’s common to hear talk of Dial-a-Ride innovation as though it somehow changes the fundamentals of service to low-density areas. It does not. Labor remains the dominant element of transit cost in developed countries, so ridership per revenue hour remains a good unit for assessing performance. Dial-a-Rides can do wonderful things, but they’re still Coverage services. In any large urban area, you wouldn’t run them if maximum ridership were your only goal. Why is New York’s Transit “Always in Trouble”? 9 Responses to Can Dial-a-Ride Get High Ridership from Low Density? Thanks Jarrett for putting numbers behind the difficulties of Dial-A-Ride. I had the same thought as anonymouse…a Dial-A-Ride service supported by smartphone technology. To my knowledge there is no good implementation of this. Perhaps the best execution would be to ask people requesting a ride to walk the few blocks to their nearest arterial. That way the service would be something closer to a dynamically-optimized fixed route system. Many transit agencies operate separate paratransit services (TriMet being one example), for the mobility impaired, the elderly, etc. Perhaps these things and a general dial-a-ride service could be united somehow? Scotty. Yes, that’s almost always part of the calculation. I wouldn’t be surprised if there’s already an iPhone app or something to connect people looking for ride shares. Seems to me that Dial-A-Ride riders should get a discount for acting as a group at a single pick-up. It is not costing much more to pick up 3 people at a stop than one. Jarrett, I’d love to hear your take on family fares on transit. When I was in Hamburg, it was common to have group fares on transit, where four people could get a pretty inexpensive ticket to ride the system for a day (maybe a weekend day, maybe not). The point is that for transit to be competitive with automobiles, such fares have to be available, especially in the off-peak. A car or a taxi has a fixed cost per trip (or distance), and does not charge for the second, third, or fourth passenger. This is why families take road trips, because buying four individual plane tickets is so expensive, it destroys the economy of air travel. It is why many groups of young people would sooner take a taxi than a subway. With transit, a family of four would have to pay up to 16 dollars to go to the zoo or downtown and back on transit. Addressing the Dial-A-Ride question from the perspective of non-emergency Medicaid transportation, where the trips to clinicians are scheduled in advance and Medicaid pays for them, it’s not the easiest thing to get full vans. Many people just miss their appointments. In Denver, Dial-A-Ride seems to be used largely to funnel people from existing suburbs or semi-rural areas into (And out of!) the light rail system, in order to discourage them from driving all the way into (or out of!) town. It seems rather effective for that purpose. If you have to go to some suburban location within the dial-a-ride area, you can now schedule a pickup at the train station and a return pickup, rather than driving the whole way (because the suburban destination was previously not accessible from the train station — the “last mile” problem). This seems to me to be one of the more practical uses of dial-a-ride. Most dial-a-ride services (in the US) tend to be much more expensive, on a per-passenger basis, than fixed route service. (I’ve heard that DAR costs $15+ per passenger, where as a fixed route in a lower-density suburban area is more like $5/passenger) That’s why the vast majority of US dial-a-ride service is limited to federally mandated handicapped (“ADA”) service. There are a few general public DAR services here and there, where local governments have seen fit to subsidize them. Airport shuttle vans (“Supershuttle”, etc.) are also in the ball park, although they focus on serving a particular destination (airport). They are, of course, unsubsidized, and charge much higher fares than transit. To the rider, the advantage is that, instead of walking to a bus stop, riding one or more buses (incurring a transfer) and getting off and walking to the destination, the rider can be picked up at home and delivered directly to the destination, as if in a private car or cab. The problem is that in a reasonably productive DAR, the vehicle may be stopping to pick up other riders as well. Too many intervening stops, and much of the advantage of DAR over the fixed route system is destroyed. So it becomes a balancing act: increase productivity or provide a relatively fast ride for the passengers already onboard. 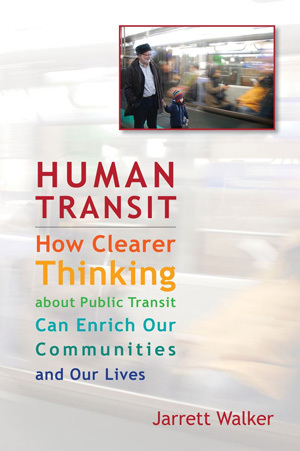 Home › Demand-Response › Can Dial-a-Ride Get High Ridership from Low Density?